A D.C. man believes his videos will show the improper searches and stops that are done in the District. 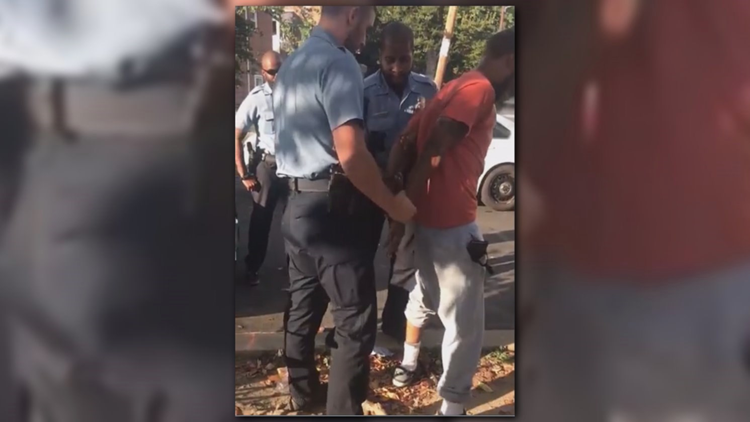 WASHINGTON (WUSA9) — WASHINGTON (WUSA9) -- The District may not look the same to some as it does through the lens of “Soup Visions,” a small YouTube page dedicated to videos of D.C. police stopping and frisking people in Wards 7 and 8. Those two areas are the last remaining parts of the city made up almost exclusively of African-Americans. “That’s why I put my videos out there,” said the 26-year-old man, who asked not to be identified. Soup Visions' videos have been viewed tens of thousands of times. And while the man behind the camera doesn’t want to reveal his name, he believes his videos pull back the curtain on police treatment of African-Americans in his neighborhood. “There’s no trust with the police officers here, in Wards 8 or 7, and major black communities in D.C.,” he said. Soup Visions: “Everything good with ya’ll? D.C. police officer: “I’m sorry I didn’t catch that what was that? The man eventually lifted his shirt to show the officer he did not have any weapons in his waistband. The officer never stepped out of the vehicle, using a spot light to inspect the man before driving away after one final exchange. A second video, recorded by the same man on September 27, 2017 demonstrates how fine the line can be between a justifiable and non-justifiable search. It also highlights why some believe it is important to record as much information as possible about stop and frisk. The video shows a D.C. police officer who had spotted a man drinking in public. With a closer look, the officer saw the man had small bags of pot in his sock. The pot was within the legal limits in D.C., so the man told police they could frisk him. In general, there are two levels of searches police can do. The first is a frisk for weapons, which is a light pat down on the outside of clothing, like what would happen at TSA. Police can also do a second type of search, which is a search for drugs. That search can be much more invasive. But police cannot do that more aggressive search for drugs without probable cause of a crime. Police did not appear to have probable cause of crime in what is shown on the September 27 video, despite the fact the man told police they could search him. But the man never specified which type of search he was consenting to because the officer never stated what he was looking for. The man’s reaction makes clear he does not consent with where the officer is placing his hands. If the man in the video did not specifically consent to a drug search, and officers did not witness him committing a crime, officers did not have the constitutional right to search him for drugs. However, the officer wrote the following in an incident report: He felt what he believed to be “contraband” hidden in the subject’s rear end. The man was released and allowed to leave, but not without what sounds like taunts from that police officer as the patrol vehicle drives away. “How ya’ll doing world star? How ya’ll doing world star? (inaudible) free the workforce,” the D.C. police officer said over a megaphone. The American Civil Liberties Union of District of Columbia isn’t laughing. “This is exactly the type of abusive interaction between D.C. police and residents that motivated D.C. council to pass the NEAR Act data collection requirement,” said ACLU of DC senior attorney Scott Michelman. Michelman’s comments came after WUSA9 showed him the video during the stations reporting. The Neighborhood Engagement Achieves Results or “NEAR Act” was created in 2016 to force police to record a lot of details about stop and frisk. That reportable data is meant to keep D.C police in check to make sure officers aren’t unfairly and unconstitutionally profiling African-Americans. But in March, WUSA9 reporting revealed D.C. police was not following that stop and frisk data collection law. Days later, Chief Peter Newsham admitted to the D.C. council the police department still doesn’t have a system, or even plan, to start collecting the stop and frisk data now more than two years after the law was passed. “So to the extent there has been a delay to this data piece and not a complete understanding of the necessary infrastructure changes that would be required, um, we’re guilty,” Chief Newsham said during a March 29 budget oversight hearing of the Judiciary and Public Safety Committee. That means there is no comprehensive data on stops like the ones captured on Soup Visions videos to determine whether they were by the book. WUSA9 approached Chief Newsham to discuss Soup Visions videos, and whether the interactions were by the book. Newsham refused to answer questions. “We can’t work with you I’m sorry,” Newsham told investigative reporter Eric Flack, adding he didn’t agree with WUSA9’s reporting. “You have misled the public according to my public information officer and some of the things you have done have been unethical,” Newsham told Flack. The man behind those street videos is also still waiting for answers, about how police treat the people in his neighborhood. “It’s like I’m not even welcome to walk down my own street,” he said. WUSA9 stands behind all the station's stop and frisk reporting.